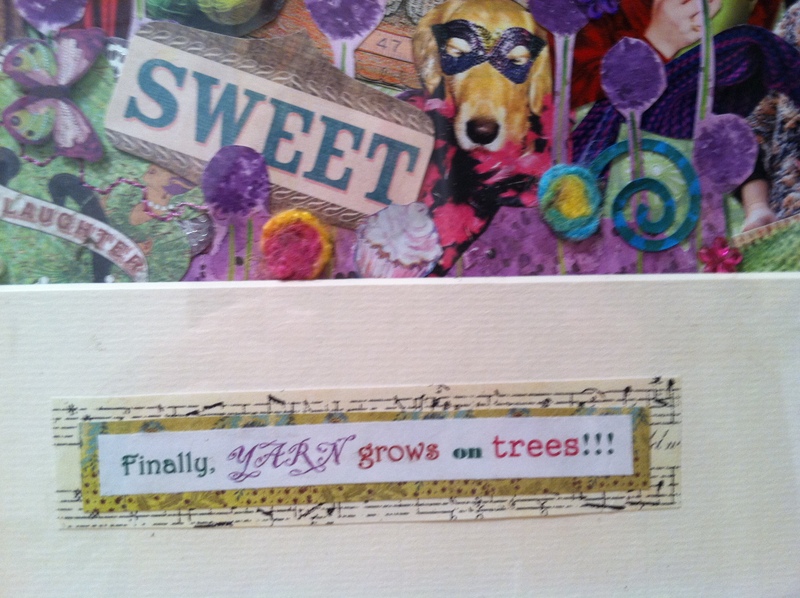 Finally… Yarn Grows on Trees!!! I have the most amazingly, talented little sister! Kit has always been very creative. As a kid, I remember her making really neat collages on poster board, using cut up magazines. She just had an eye for putting things in certain spots and transpiring a plain poster board into a really cool piece of art. She was also great at drawing back in high school and I recall her making me a picture of a rabbit, using just ink dots. She currently lives in Chico, CA with her husband and family and she is still making fabulous crafty creations. She mostly paints nowadays, but recently she made some very creative collages. She made one for my mother, one for my father, and one for me. 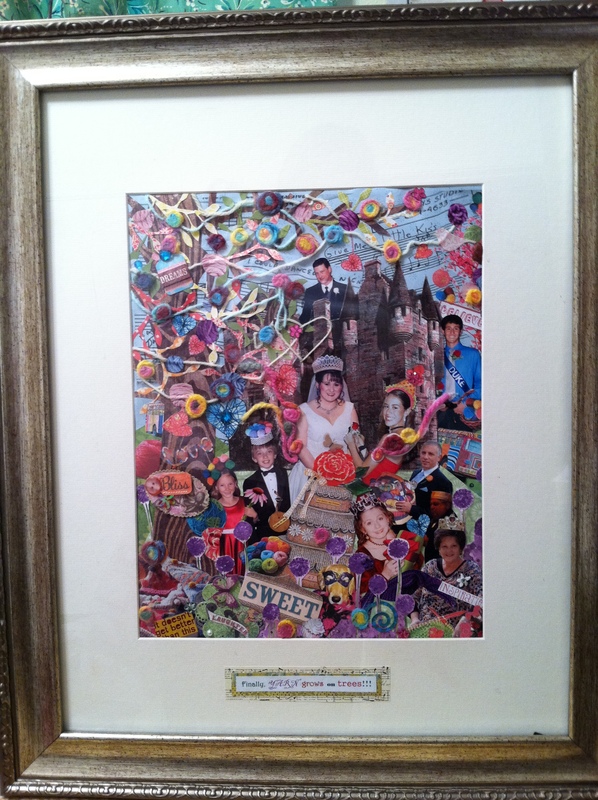 She adapted each collage to each person’s personal interest. 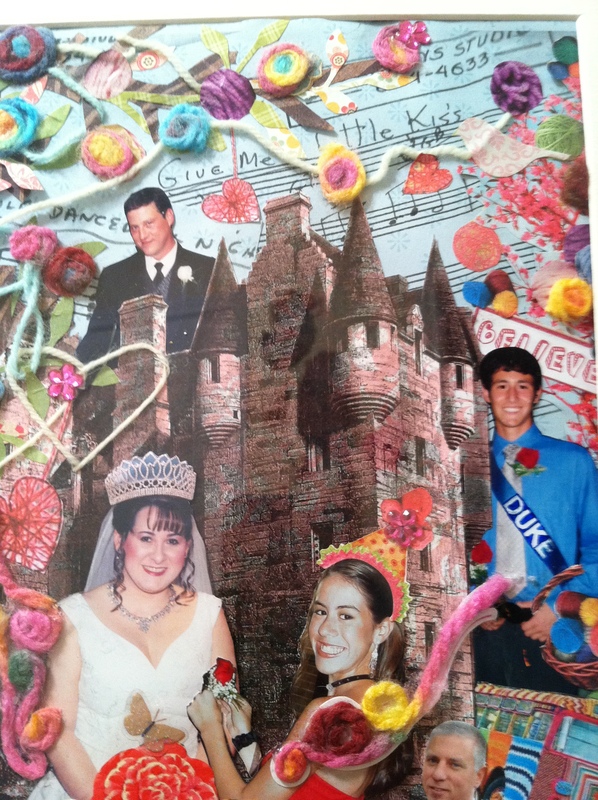 Each collage includes pictures of the family, as well as things related to our lives. My sister knows that my one of my favorite hobbies is knitting. 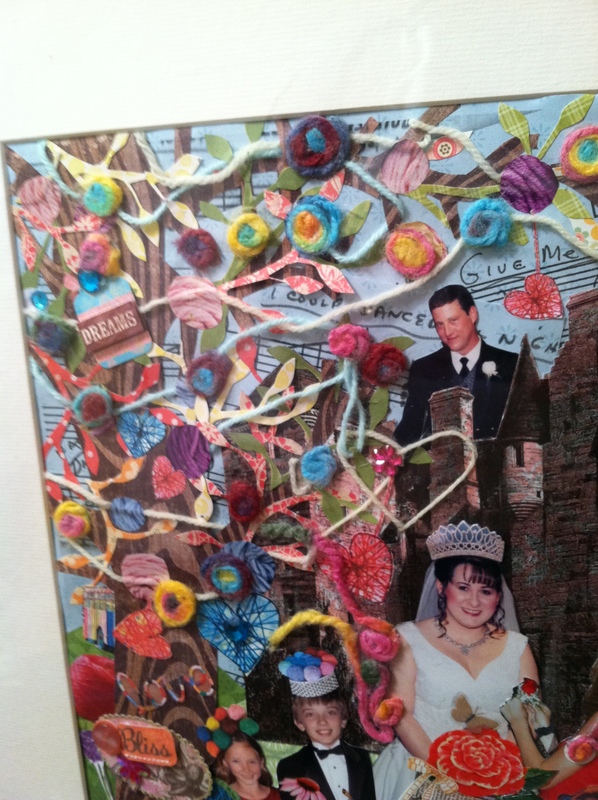 So she created a collage, which she entitled “Finally… Yarn Grows on Trees”. The details are amazing. The collage is of a mystic, fairytale like scene and includes photos or me, my husband, my kids, mom, dad, Kit, her husband and her kids and she even included my dog, Dottie. The scene is of a castle and a huge tree that appears to be growing 3-dimensional balls of yarn! She used a photo taken of me on my wedding day and jazzed it up by adding a crown to my head, a larger (more colorful) bouquet and a little butterfly. She then put a castle in the background and put a picture of my hubby, from our wedding day, at the top of the castle. It appears that he is my knight and shinning armour, coming to my rescue me and live happily ever after. And he is my knight and shinning armour… and I’m sure we will live happily ever after. We’ve been married over eleven years now. The details on this is amazing. I took several pictures, but the pictures I took don’t do this piece of art justice. I’ve hung this collage in my knitting room. I think it’s the perfect piece of art for my room and I love to look at it as I knit.